News Room - LOTS OF NEWS!! SEE BELOW!! If there is news to tell, updates to the site, or articles/videos in which LOZ:TPN gets a mention, we will post it here. Check out her Midna voice. What do you think?! Do we have some BIG news for Twilight Princess Novel fans! Stephonika W. Kaye, author of the online novel has announced plans to work on an audio book version of the novel. She said in her announcement, "I decided to do this audio version because I've had a few comments in the past of how fans would take time out for it if they didn't have to read it, and if there was an audio version available." It seems that she has embarked on this venture to not only try to reign in more Zelda fans to her work but also to practice voice work since she would like to go into doing voice acting. But this audio book is only a side project, she says, so we can't hope to see the finished version any time soon most likely. "I will only be working on likely the prologue and chapter 1 for the audio book version, as the other chapters have some small things I still need to correct before recording them." We can understand the reasoning behind this decision since she still has a good bit to write, but we (and we hope you, too) are anticipating the release of her first few chapters and her continuation of the audio version. To take a listen to her 2 minute preview she recently posted to her youtube channel, you can watch it below. Be sure to come back to the site (or subscribe to her channel), as we will keep you updated when we hear more about this exciting new project. Tell us what you think! This is the site where Twilight Princess history was made, when Kaye first announced her plans to adapt the game, and it also marks the beginning of the friendship between the author and the admin going by the alias "Jaiden." Only one short month after posting this would Kaye find herself joining DeviantART and begin posting and exposing her work on TPN to a larger audience. Original Home of the TPN Found! Stephonika W. Kaye has said many times that DeviantART was NOT the first place she began posting her novel. 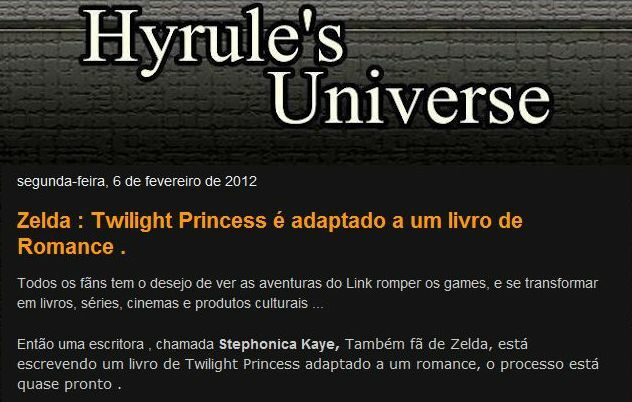 It was on another little forum (now inactive) called the Zelda Hangout where she posted the novel for the very first time to the public. We have finally found that site and linked it to the photo to your left. Kaye has also stated many times that the novel's start date was in March of 2007. Based upon this evidence, however, the official start date seems to have been April 18, 2007. Perhaps the confusion came from her "join" date to the forum, which was March. It's easy to forget details from 5 years in the past, so we'll let this one slide. But as a part of TPN history, we felt it necessary to post our findings for all the TPN fans out there. The post to the left that announced the project received 571 views, and the thread actually holding the novel had garnered 400 in its short life there (the last post listed on the forum was made August 3, 2008). 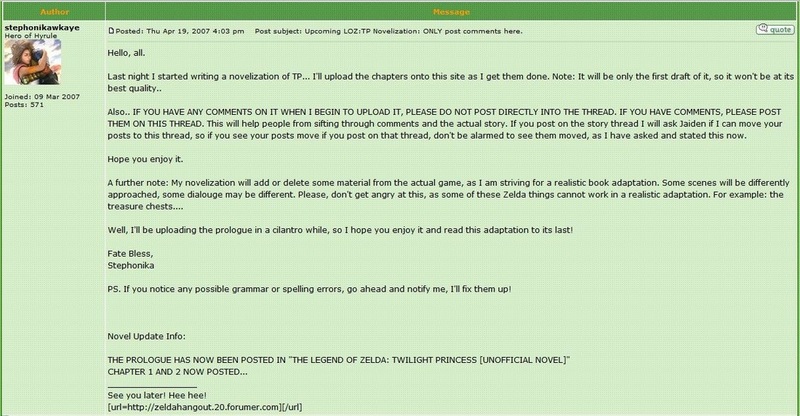 Fellow Twilight Princess fan by the name of Warrior of Fire, posted on his forum back in March about the TPN project, calling it a "beautiful" novelization and "well-written." Though, he writes that he had only read the prologue plus five chapters, he urges other fans to take up the book for a read. Click on the photo to view the forum. To be honest the forum doesn't seem to be too active, with only four members, but when we found this post yesterday it had garnered 61 views, and has since then risen to 66, so somebody is looking, as it is the #1 viewed post on the forum (compared to the average 5 or 6). 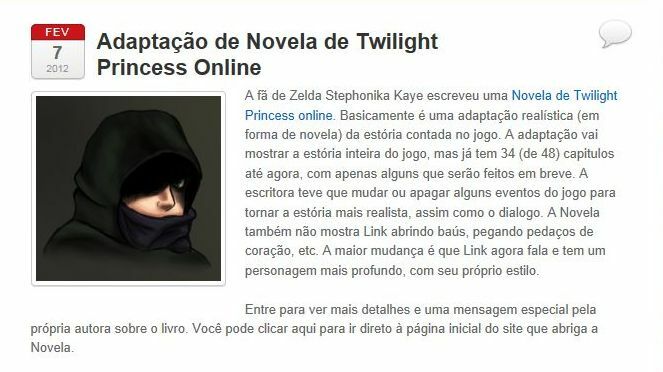 Apparently when the news hit Zelda Dungeon about the Twilight Princess novel project this past February, fellow fans were re-blogging the news, even into the Portuguese-speaking sites. Zelda World Blog and Hryule's Universe. To the left are links to their home sites (Click on the photos). In the video to the right, Kaye says that she needed to play Twilight Princess in order to visit Telma's bar and figure out what, if anything, was said by the Group at this point in the game/novel (between the Twilight Palace and breaking the barrier over the castle). She takes us on an interesting short adventure and also talks about other random things within the game, whether it be the lack of realism in Castle Town citizens' dialogue, questioning the purpose of the horse call, or her anger at a Skyward Sword gameplay inability in comparision with TP. If anything, it is exciting to see the author actually taking the time to play the game that she is adapting to the page. Take a look at her video and leave a comment today! In the article featured on Zelda Dungeon's website, "Mases" gives mention of Kaye's work on the novel. Though the author of the article has not fully read the novel, they state: "The amount of detail in there is astonishing and it is such an excellent retelling of a great game." <-- CLICK THE PHOTO to read the article, and, perhaps more entertaining, are the comments from fellow fans. Check out what they have to say! In the video to the right, a fan of Zelda talks about how, when he went to write his own fiction of Twilight Princess, he searched the internet to see if there was one already in existence. Needless to say, he found one. Take a moment to listen to him talk about Kaye's novel adaptation.